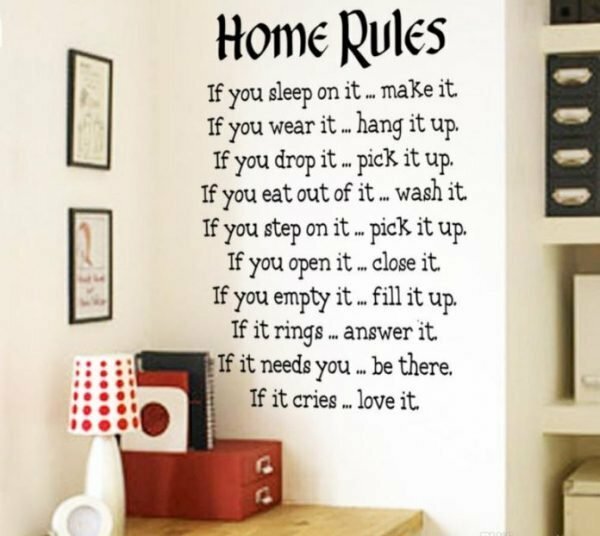 Print and frame favorite quote from the book and place it in a place of honor on your wall. On that way, you can always look at the important thoughts of your favorite books. 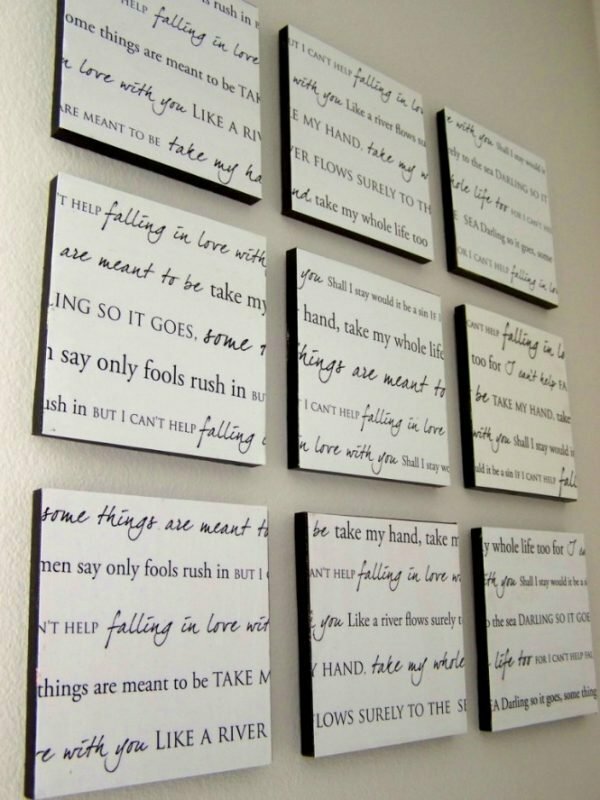 Decorate your walls with your favorite motif or a message in a simple way. If you are skilled at painting, you can paint them, and for those who don’t want to experiment with brush and colors, there are other ways. 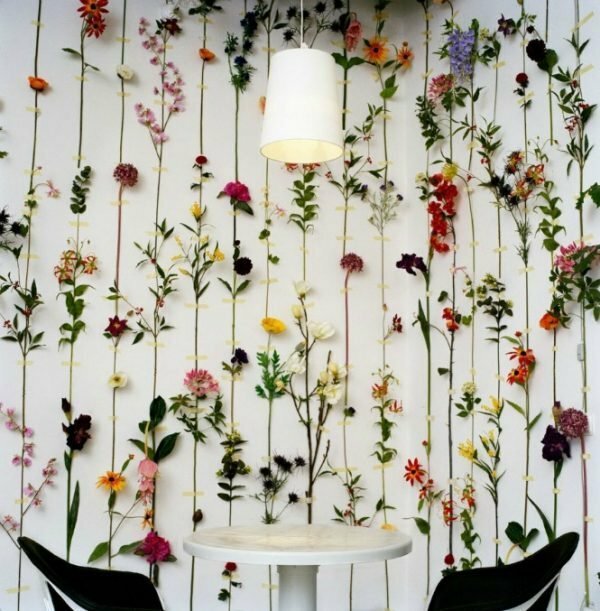 You can use wallpapers, stickers or self-adhesive decorative paper. 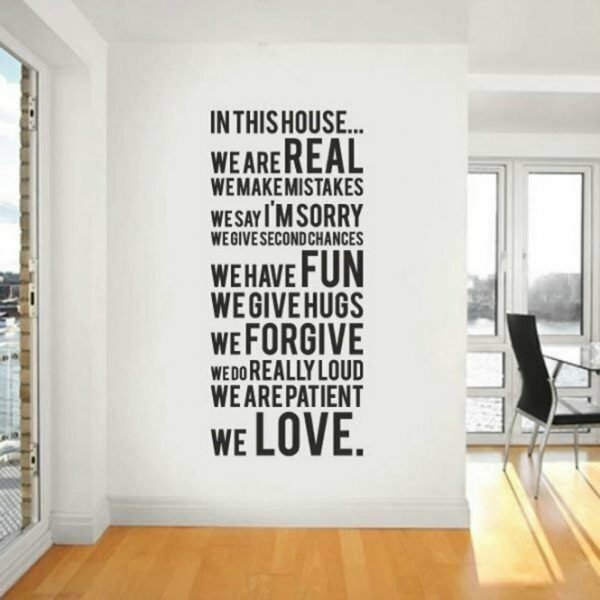 If you have a motto that you want to share with all those who are part of your life, a message written on the wall is a great way to do it. 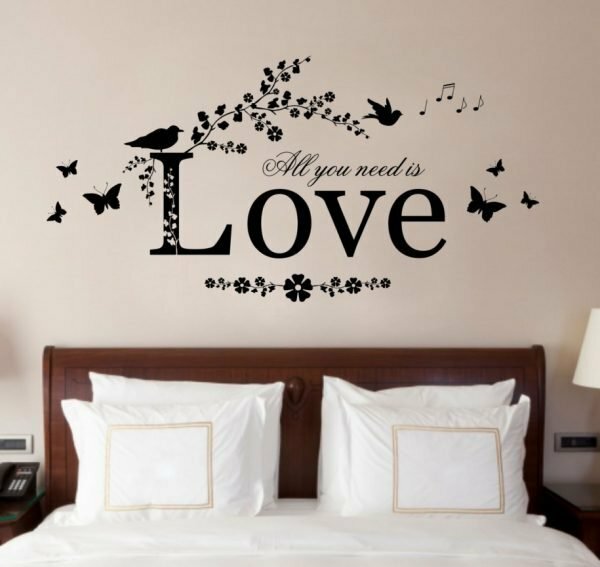 The message can be painted by hand, using your favorite color or you can print and cut the letters and glue them on the wall. The contrast of black letters and a white wall will look modern and elegant and will easily fit in the space. 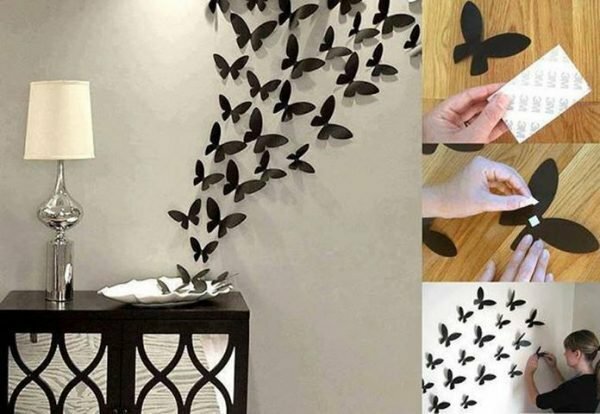 Decorate the room with flowers in an unusual way, on the wall in parallel strips glue twigs colorful flowers, and the effect will be phenomenal. You can set fresh, dried or artificial flowers. 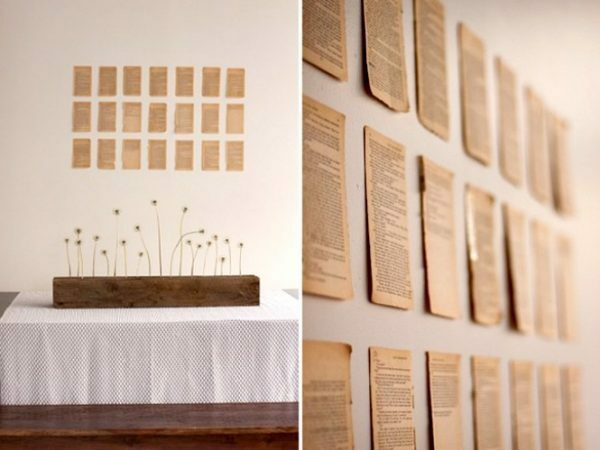 Pages of your favorite books arrange symmetrically on the wall and paste it with glue for wallpaper. 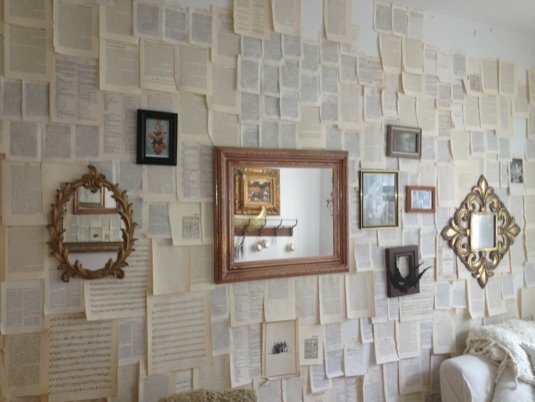 On the white wall of your living room, the pages of old books will certainly take center place. However, the phenomenal effect will be achieved if this way decorate your study room, which will become an inspiring place. DIY has such great ideas. As an artist myself, I appreciate the opportunity to view the ideas of other creative people. I think, “WoW! Who would’ve thunk? What a great idea!” Today, fellow, fellow creative minds, I could use your help. My son & only child, died on Dec. 2, 2016. I miss him so much. On August 10th., he would’ve been 51. I know many of you go through those sad days during the anniversaries of the loss of a loved one. So… my dilemma is creating a memory wall for my son. I have all these photographs and… I have never been good at organizing pictures on the wall. He was an all around athletic. We are from Oklahoma so he is an Oklahoma Sooners Fan and, of course, an Oklama Thunders Fan. He had been living in Baltimore for a number of years do he was a BIG RAVENS FAN. His bigestest dream was for the Ravens to go to the Super Bowl. I loved my son so much! I was 19 when he was born August 10, 1967, at Chanute AFB in Rantoul, Illinois. His Dad went to Viet Nam in 1969 and, by the Grace of God, came back alive and whole. We both miss his every minute of every day and want to honor him. I want his memory wall to both honor & respect his memory. God Bless Everyone for reading my request.